For years we've bemoaned the lack of a diesel option in the Golf range. No more. Not only is the 2010 VW Golf TDI coming to America, it'll be available with a manual, lowered sport suspension and 42 MPG highway! The MK VI Golf will start at $17,490 for the two-door and $19,190 for the four-door when equipped with the crappy 2.5-liter five-cylinder. The TDI starts at $21,990, but helps justify that increase with a standard touchscreen audio interface with Sirius satellite radio and the afformentioned sport suspension. The 2.0-liter turbodiesel makes 140 HP and 236 Lb/Ft - good for 0-60 MPH in 8.6 seconds - and comes with either a 5-speed manual or 6-speed DSG gearbox. Equipped with the manual, the TDI returns 30 MPG city, 41 MPG highway; equipped with the DSG, it does slightly better at 31/42 MPG, 2 MPG better than the 2009 VW Jetta TDI. 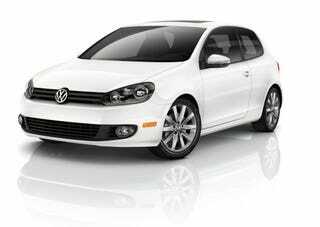 anticipated, athletic yet extremely fuel efficient, TDI clean diesel engine. upon, but also looks, drives, and feels fun at the same time. of any Golf to date. appearance give the hatchback a more commanding road presence. integrated clear turn signal and reverse indicators along the bottom edge. insert and a cutout for a pair of exhaust tips. compliant, 2.0-liter four-cylinder clean diesel TDI engine. travel, and an 8.1 second run to 60 mph from a standstill. rpm, and an impressive 236 lbs.-ft. of torque between 1,750 and 2,500 rpm. rider-friendly in most any driving situation. leather-wrapped version with multifunction controls on TDI models. key information regarding the selected gear, fuel mileage, odometer, and more. Up top, a full power sunroof can be ordered on all Golf models. changer with MP3 CD readability, theft deterrence, and an auxiliary input jack. free calling with a paired mobile phone, is an option on all 2010 Golf models. display, as well as the digital display located in the instrument cluster. also offer the option of having rear side thorax airbags for outboard passengers. and/or reduces engine power as needed to help maintain directional control. current Volkswagen owners to driver farther between scheduled oil changes.